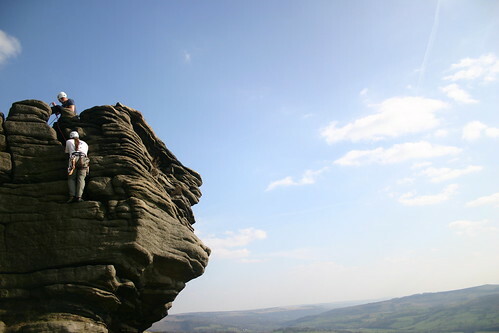 We went climbing over Easter, as I mentioned before, and spent four days climbing on gritstone in the Peak District. The climbing was really good – we had four days of good weather. I tried my hand at leading (well, I severely scraped my hand whilst leading) for one of the days, but I was feeling a bit under the weather for most of the time. We stayed at Ed’s gaff, and were very kindly catered for (fry-ups every morning are not to be sneezed at). Being a bank-holiday weekend made getting out of the national park…interesting, and at 7 quid for a burger the Wimpy at the service station was a rip off. But these are all ancillaries to a great weekend, and pretty much doubling my outdoor climbing experience after two previous trips to Wales. I took loads of photos, and put them up on flickr a couple of weeks ago – attrating a few comments and favouritings, which is nice to see. Below are some of my favourites out of my Eastern Grit set on flickr. Enjoy! This entry was posted in Uncategorized and tagged Life, Photography on April 25, 2007 by Andy. I’m back at work now, which is unfortunate but somewhat expected. I took some time off work to extend my Easter break out to a full fortnight, and had some fun doing things I wanted to do. I got a new phone, for one thing. My old one wouldn’t do left and right button presses, and stopped sending text messages too. When I couldn’t figure out why, and went to the Orange shop on a nice and quiet Monday morning, they just gave me a new phone instead, and lowered my bills as part of the bargain. Nice approach to problem solving. I bought a new camera bag – a camera rucksack really. It’s really nice, and really tough too. I was getting fed up carrying all the bits and bobs split between my old camera bag and my daysack – I’ve bought a lot more stuff since I was given the bag a few years ago! I’ve already worn it whilst climbing and roughed around with it – I’ll probably review it properly at some point. I went climbing in the Peaks with a few people – but the photos from that are nice enough to deserve their own posting (to follow). I did lots of other things too – cycling on the Thames, going to the Tate Modern, going picnicing and drinking and openstreetmapping and all kinds of fun stuff. I need to find a seasonal job, like one of these work hard for 6 months and we’ll give you six months off type things – I’ve got too many things I want to do, and two days each weekend just isn’t enough! This entry was posted in Uncategorized and tagged Life on April 19, 2007 by Andy.